Easy Breezy Prosperity is a holistic guide to discover and nurture prosperity and align your life with your spiritual core. Author Emmanuel Dagher redefines what real prosperity means and offers you tactics to expand and enrich yourself well beyond financial goals. By examining how and why we treat money the way we do, Dagher shows you how to realize the success you have already created and cultivate the clarity needed to attract more of it in your daily life. Each chapter is designed to empower you, leaving you feeling optimistic not only about their working lives and finances, but also your entire life's path. 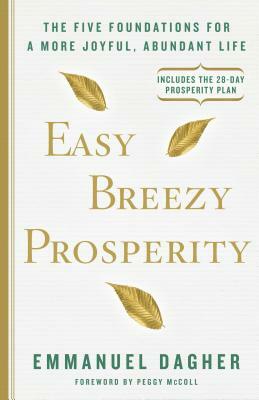 Easy Breezy Prosperity is a powerfully motivating plan to take action, strengthen self-confidence, and enjoy a more joyful and abundant life. Emmanuel Dagher is a transformation specialist, holistic health practitioner, teacher, and humanitarian who helps others create positive shifts in their lives. He is the author of Easy Breezy Miracle. He lives in Los Angeles, CA.